Nootropic supplement Onnit Alpha BRAIN will be examined in this review. It is claimed to optimize brain health and performance and can be used to reach an enhanced dream state. Athletes benefit from a heightened reaction time and quicker analysis, speakers have better recall of names, words and ideas while students and executives benefit from mental energy and greater focus. Below is a list of Alpha BRAIN’s ingredients and our opinion of it if should you choose to read onwards. As part of the Onnit Flow Blend, L-Tyrosine is used to support brain function and by the body to produce L-Dopa. L-Theanine is a key ingredient in green tea that is capable of keeping the body in a state of calm. Oatstraw aids in the management of stress. Phosphatidylserine relieves stress, boosts the body’s ability to exercise and improves cognitive function. As part of the Onnit Fuel Blend, Pterostilbene, an antioxidant found in blueberries, helps eliminate free radicals, which are thought to contribute to brain fog. Alpha GPC is an important component in the Onnit Focus Blend as it encourages learning processes and brain function through acetylcholine synthesis and secretion. Acetylcholine is linked to mental drive, memory, REM sleep and focus. Bacopa Monniera plays a role in keeping nerves in the memory center of the brain healthy. Huperzia serrata inhibits acetylcholinesterase, which would breakdown acetylcholine. As a result, it prevents optimal brain function from diminishing. Vitamin B6 helps in the manufacture of amino acids and neurotransmitters, which are needed to reach optimum brain function. Its capsules are vegetarian although the ingredients within them may not be which may make them unsuitable. This supplement is appropriate for celiacs as it is gluten-free. This supplement contains ingredients sourced from soy so those with a soy allergy should take caution. One to two capsules taken in the morning or early afternoon are needed to enhance mental performance. This dosage can be increased to three capsules if you weight 200lbs or more. One or two capsules should be taken four to six hours before sleep to help reach an enhanced dream state. No more than three capsules should be taken within a 24-hour period unless you have been directed to do so by a medical professional. Onnit have not listed any side effects for this supplement. However, they have issued a number of warnings that most likely prevent any bad interactions. Children under 18 and pregnant, or lactating women should not take Alpha BRAIN. Those with medical conditions, on medications, particularly those for cardiac health or blood thinners, over the counter products or taking dietary supplements not made by Onnit should consult with their health care professional before taking Alpha BRAIN. There is a possibility of an allergic reaction to soy but if any other adverse reaction occurs, taking of the product should be discontinued immediately and a health care professional consulted. Onnit sell a 30-capsule bottle of Alpha BRAIN for $34.95 on their webpage, which works out at about $1.17 per capsule. They offer two 30-capsule bottles for $59.41, at 99 cents a capsule, and a 90-capsule bottle for $79.95 or 89 cents a capsule. Those who opt into the #StayOnnit scheme, which involves receiving automatic deliveries of Onnit products, can receive a 20% discount on their first supplement or food purchase. This scheme would reduce the price somewhat but the discount would only occur once. Onnit do not appear to have a guarantee policy for any of their products, which is disappointing. Although Alpha BRAIN may be effective, there are still likely to be people who are dissatisfied with it who will have no way to return it for a refund. 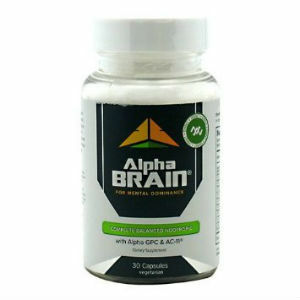 The product has received very positive reviews overall with Alpha BRAIN garnering a rating of 4.3 stars out 5 as well as high ratings for quality and value. Alpha BRAIN is a product that has been highly praised by many and is endorsed by a number of celebrities so it appears to be a quality supplement that is also effective. Although no mention of having been manufactured in GMP Certified facilities is made, Alpha BRAIN has received a different sort of certification, namely it is BSCG (Banned Substances Control Group) Certified Drug Free. It is also a product that is gluten-free and caffeine, making it seems like a better alternative than other stimulants for people with celiac conditions. However, Alpha BRAIN is quite expensive with those who merely want to try the product, to see if it works for them, are forced to pay out more than a dollar per capsule. Furthermore, the supplement comes with no guarantee, meaning that spending that sort of money on a product like this may leave a person out of pocket. The manufacturer also neglects to mention any side effects although the product does come with extensive warnings. The actual strength of the product is unknown, as the amount of each ingredient in each of the three Onnit Blends is not disclosed. This product may be a risky and expensive buy for a consumer although it could be safe and of good value for a number of individuals. Henry Costa	reviewed Onnit Alpha BRAIN	on November 20th	 and gave it a rating of 3.